In Crawford v Washington, the Supreme Court substantially changed its understanding of how the Confrontation Clause applies to hearsay evidence. Since then, the Court has issued three bitterly contested expert-evidence-related Confrontation Clause decisions, and each one has generated at least as many questions as answers. This article analyzes this trilogy of cases, especially the most recent, Williams v Illinois. In Williams, the Court issued a bewildering array of opinions in which majority support for admitting the opinion of a DNA analyst about tests that she did not perform was awkwardly knitted together out of several incompatible doctrinal bases. The most prominent and fully developed argument for admission was that the references to the work of the analysts who actually did the testing but who never testified were admitted for a purpose other than their truth. Although we maintain that this argument is, on the facts of Williams, implausible, we also recognize that in other, relatively limited instances, expert basis evidence might legitimately be introduced for a purpose other than its truth. After striving for precision on this doctrinal point, we step back and suggest that the ongoing anxiety about how to think about expert evidence and the Confrontation Clause exists in large part because the Court has yet to face directly a set of larger, background concerns. There is significant uncertainty about how, and to what extent, scientific evidence should be treated as special or distinct from other kinds of evidence for confrontation purposes. We suggest that scientific and expert evidence might warrant some limited special treatment, based on what we see as one of the most critical dimensions of scientific knowledge production — that it is a collective, rather than an individual enterprise. 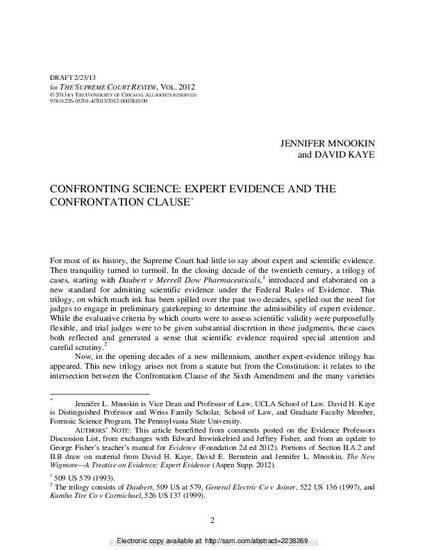 Recognizing that scientists inevitably rely and build on facts, data, opinions, and test results of others, we suggest that courts should engage in a modest form of scientific exceptionalism within Confrontation Clause jurisprudence, through efforts to create procedures that respect the fundamental values of the Confrontation Clause, but also adapt when necessary, to the epistemic structures and processes of science.